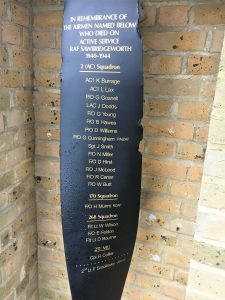 When the memorial at former RAF Sawbridgeworth was built in 2006, it included a propeller blade from a crashed Mustang containing the names of air and ground crew who died while flying from or working at the airfield. Subsequent research has found that we omitted several names and included some that were incorrect. The propeller blade was re-painted with the correct names in time for 2017 Remembrance Day.